Needless to say, Canada’s boreal forest is tremendously important to us all. As leaders in the forest products industry, Resolute knows we have an important role in the preservation of Canada’s boreal forest. Responsible environmental stewardship is both an ethical obligation and a business imperative. Responsible forestry operations begins with protecting natural habitats, which is why 100% of the woodlands that Resolute manages are independently certified to one or more of three internationally-recognized sustainable forest management standards. Resolute recognizes that our operations have an inherent environmental impact through the consumption of resources and generation of waste. We are committed to a culture that continuously seeks ways to reduce or eliminate our environmental impact. Over the past 15 years Resolute has made remarkable progress on a number of environmental initiatives. We also support 100% regeneration of the forests we harvest, whether though natural regrowth or reforestation from planting seeds or seedlings. 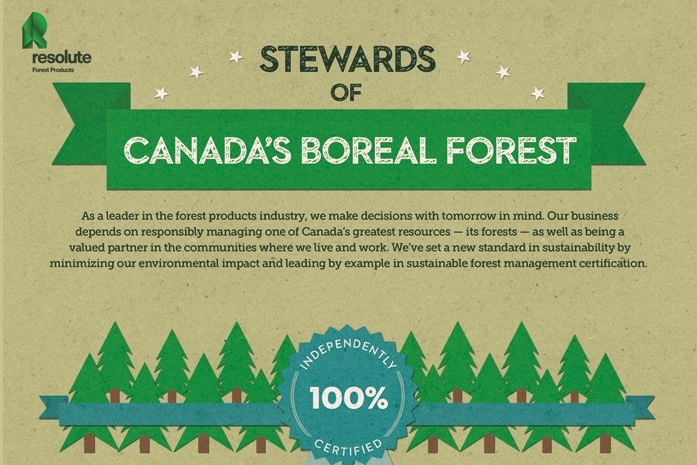 The Canadian boreal forest is also an important contributor to Canada’s economic prosperity. Each year the forest products sector contributes nearly C$20 billion to our gross domestic product (GDP). The industry employs 566,500 Canadians, and is a significant employer of Aboriginal peoples. Shared prosperity depends on both the sustainability of the natural resources in our care and the performance of our operations. Check out the infographic below to learn more about how Resolute manages the resources in our responsibly and sustainably while helping to drive the economy in the communities where we operate.